On Friday, September 18 from 6-8:30pm, Team Screens 'N' Spokes is teaming up with Cadence Cycling to celebrate their new cycle shop in Manayunk and the upcoming Bike MS ride. Come join us for a showing of more than 20 bike-themed prints and complimentary beer, wine, & snacks. Prints are for sale (framed & unframed). All proceeds benefit the National MS Society. Founded in 2007 in Philadelphia, Screens 'N' Spokes is an art show, a bike team, and a group of folks taking a stand against Multiple Sclerosis. Indie rock posters? Bikes? 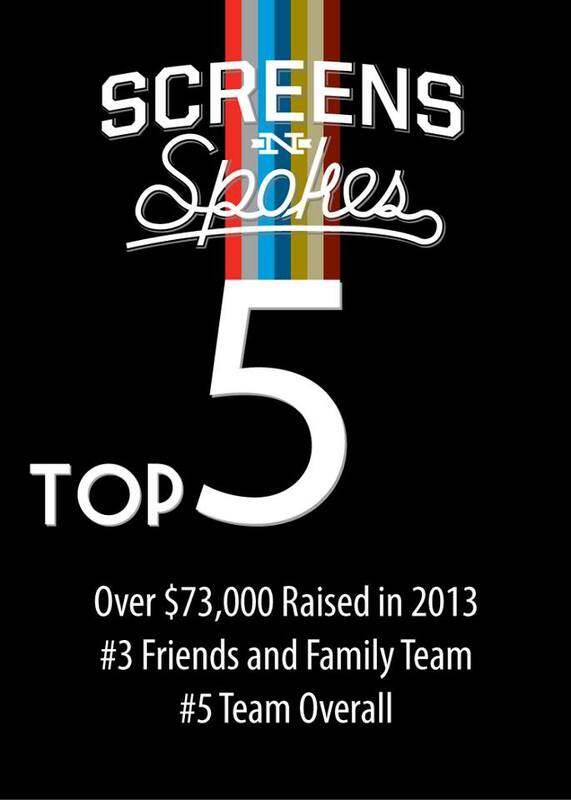 Screens 'N' Spokes unites them to create a fundraiser for the people. Over the past 9 years, more than 50 gig poster artists have created original screen prints for the event. All artwork is donated by the artists pro bono and then sold to benefit Bike MS. Many of the artists have been touched by MS in some way, and want to pay tribute to their loved ones living with the disease. All the prints are incredibly affordable, from $10-$40 unframed. After the art show, Team Screens 'N' Spokes literally takes to the streets, fielding a team of riders in the Bike MS City to Shore ride. This year's ride is October 3-4. Come out and enjoy happy hour with us - we'd love to see you! This year we partnered with two longtime collaborators, Jay Ryan and Rich Kelly, on two prints to commemorate the 2014 Bike MS Rides that Team Screens 'N' Spokes is riding in this year. On the left hand side we've got Jay's 7th Screens 'N' Spokes print (incredible...). Designed for the City to Shore ride, where we bike from Philadelphia to Ocean City, NJ, these beautiful prints feature Jay's classic creatures (are they bears? dogs? rabbits?) on their way through a watery backdrop. Both prints are now available in our Etsy Shop! They will also be available at the Screens 'N' Spokes Brooklyn Show, at Cotton Candy Machine, on October 18th. We sported a black and white jersey designed by Austin designer (and SNS friend) Bobby Dixon at Kollective Fusion. The jersey’s clean lines allowed us to focus, with “clear eyes full hearts”, on our mission. And, of course, for all team members to make it safely, with lots of fun and spirit along the way, to each day’s 80+ mile destination. City to Shore is always an inspiring event, and this year was no different. For the 2014 season, the team has so far contributed almost $60,000 to fund NMSS programs and cutting edge research. Team member Frank Boka has singlehandedly raised over $16,000 – way to go Frank! Thanks to everyone for your hard work, leadership, and generosity. Next stop, NYC (or the Great 8 Ride)! It's Small Business Saturday today! One of your favorite days of the year. Hopefully you are out in your local community supporting your neighborhood shops today. We also hope you'll keep a little of your holiday budget to spend on some beautiful limited edition prints. First up, Mystery Tubes! For the first time ever, we are offering mystery tubes, each one filled with 4 delightful Screens 'N' Spokes prints (picked at random), for just $50+shipping. We'll be pulling prints across every year and every artist, so this is an awesome way to start your S'N'S collection or get gifts for four lucky folks on your list at a really great price. Mystery Tubes are available only through December 14th, so act fast! Next up, we've got 4 incredibly priced Artist Print Packages. Perhaps you don't want a little mystery in your life, and you want to know exactly what you want to get. Fair enough. We've put together 4 print packages from some of our favorite artists, and are offering them up at some really great discounts. That means you can get 4 Judge prints for just $50, 5 Pizzoli Prints for $75, 5 Cricket Press prints for $100 and 3 Jay Ryan prints for only $75. Finally, if that isn't enough, we are offering two additional discounts. For our domestic friends, we are offering free shipping through Cyber Monday. Please, only one coupon code per order. Thanks so much for your support this year, and happy holidays! Yes, it's true. After a year off, Screens 'N' Spokes has teamed up with a handful of our favorite artists to bring you 5 brand new prints for 2013. Four of the artists have been working with us since the very beginning. Jay Ryan, Cricket Press, Greg Pizzoli and the Half and Half were all a part of that original show way back in 2007. Since then, they have been incredible supporters every step of the way. This year, we also welcome Shawn Hileman to the Screens 'N' Spokes family. We're partnering with Shawn not only on a print, but his Print Studio and Gallery, Masthead, will be hosting the 2013 7 Year Retrospective Show, October 19th, in the Northern Liberties neighborhood of Philadelphia. All 5 prints can currently be seen in the Gallery, and will be going up for sale on Monday, October 14th, at our Etsy Store. You can now find framed Screens 'N' Spokes prints up at Cadence Cycling, one of the premier cycling shops in Philadelphia. They are featuring a number of prints, primarily from 2011 but also selections from previous years. See something you like? You can buy it and take it home it home with you. We'll be replenshing the prints that they have in stock. As always, 100% of the proceeds go towards the Greater Delaware Chapter of the National MS Society. 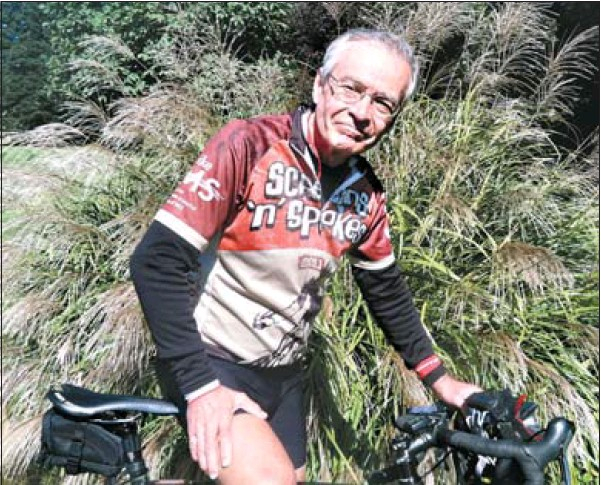 On Monday, longtime Screens 'N' Spokes rider Herold Klein was featured in a great article in the Philadelphia Inquirer. He recently completed the MS Great 8 ride, travelling 8 states in 8 days on the saddle of his trusty bike in support of the National MS Society. Herold has been an inspiring teammate and incredible fundraiser. We've excerpted the article below, please follow the link for the whole story. ...[F]our years ago, while buying sheet music at a store in Ardmore, he stopped at a coffee shop, where he saw a notice about the forthcoming MS City to Shore Bike Ride. Can I bike that far? Klein wondered. "It scared the living daylights out of me," he recalls, "but it was also a challenge." The following August, while the orchestra was performing in Saratoga Springs, N.Y., Klein began training. He cycled every day, pushing himself hard on the hills, learning how to ride long distance. "It's more a ballet sport than a football sport," he says, "more about spinning than grinding." He made it to the Shore that September and has participated in every ride since, raising more than $7,000. During last year's ride, he added a loop and completed a century - 100 miles - an experience that convinced him he could tackle the Great 8. 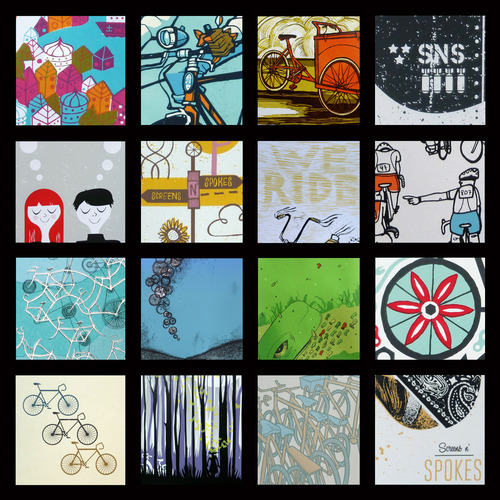 2011 Screens 'N' Spokes Prints Now Available! All 16 of the 2011 Screens 'N' Spokes Print Series are now available to order online at our Etsy shop. As you can see from above and the recent previews, I think we've got an extremely strong mix of prints this year, with a little something for everyone's style.